Please review Pickford Chiropractic Clinic’s schedule of services and associated fees. The purpose of this initial consultation is to determine whether you are in the right place and if we can help you. 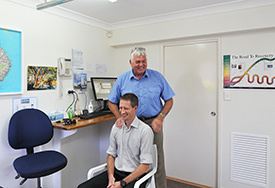 It gives you a chance to ask any questions about what chiropractic is and what it isn’t. If you and the chiropractor decide to proceed with chiropractic care, an examination will then take place and you will be referred for x-rays. These are bulk-billed through Medicare. A complete physical examination will be performed to determine if you have any vertebral subluxation, which could be causing the symptoms that you are experiencing. If we can not help, we will refer you to the appropriate health professional.